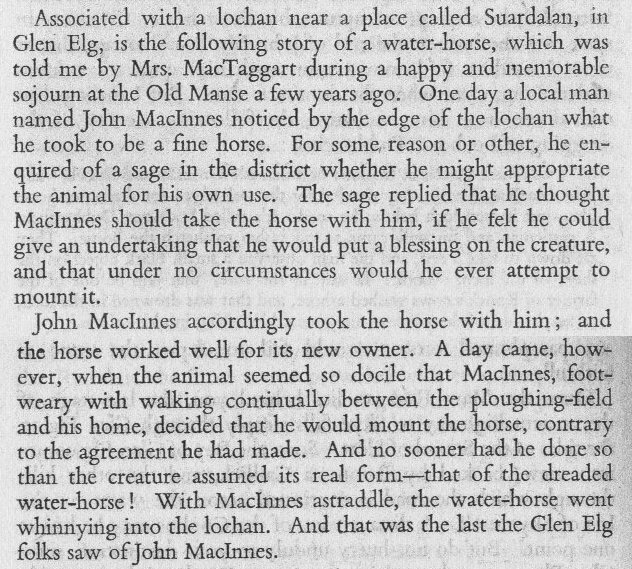 Associated with a lochan near a place called Suardalan, in Glen Elg, is the following story of a water-horse, which was told me by Mrs. MacTaggart during a happy and memorable sojourn at the Old Manse a few years ago. One day a local man named John MacInnes noticed by the edge of the lochan what he took to be a fine horse. For some reason or other, he enquired of a sage in the district whether he might appropriate the animal for his own use. The sage replied that he thought MacInnes should take the horse with him, if he felt he could give an undertaking that he would put a blessing on the creature, and that under no circumstances would he ever attempt to mount it. John MacInnes accordingly took the horse with him; and the horse worked well for its new owner. A day came, however, when the animal seemed so docile that MacInnes, foot-weary with walking continually between the ploughing-field and his home, decided that he would mount the horse, contrary to the agreement he had made. And no sooner had he done so than the creature assumed its real form - that of the dreaded water-horse! With MacInnes astraddle, the water-horse went whinnying into the lochan. And that was the last the Glen Elg folks saw of John MacInnes.